This is the happy circumstance I have spent years dreaming of, researching and planning for. After a decade of preparation, including a great deal of reading and studying, many workshops and seminars, and six years of farm ownership before retirement allowed me to move here, I finally have a small herd of beef cows to rotationally graze and improve the pastures. It sounds so easy when you read about it and imagine how it will work. What can be easier than cows eating grass, after all? 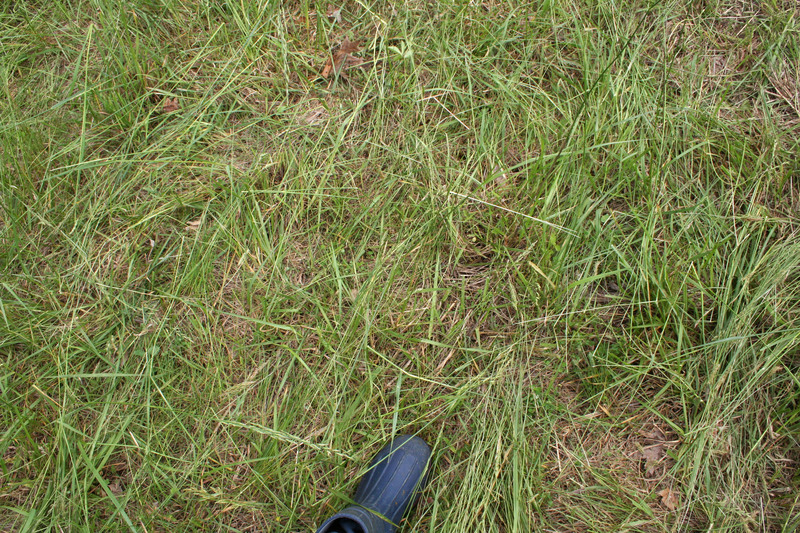 But not all grass grows the same; some pasture is quite lush while in other areas the stand is thin, weather factors a lot in how well a grazed area regrows, and moving the grazing herd around a farm in sync with the forage growth cycles can be quite tricky. So, it is anything but easy. I suppose this is some of what the “intensive” part of Management-intensive Grazing, or MiG, refers to. I’m not talking about intense physical effort, although it takes a fair amount of walking to string electric fence every day or every couple of days, and my neighboring cattle farmers would no sooner hike around their fields with an armful of fiberglass posts and reels of electric wire, than fly to the moon. No, the muscles most used, I’ve found, are between my ears – and as a novice to both the art of grazing and bovine husbandry, I am learning to use them and stretch them beyond what I’d ever imagined. This is the first year I will have seen these pastures grow from dormancy, and the first full year they will be repeatedly grazed by animals instead of mown. Last August the herd arrived to the dense stockpiled stand that had grown unmown since spring, and worked their way through it in about 6 weeks before returning to regraze their first paddock assignments. That was an abnormal grazing situation and there were more animals then, too. This year I’ll be learning as I go, with some basic grazing concepts to guide me, and the realization that it will take years to achieve what the books and experts make sound so simple. 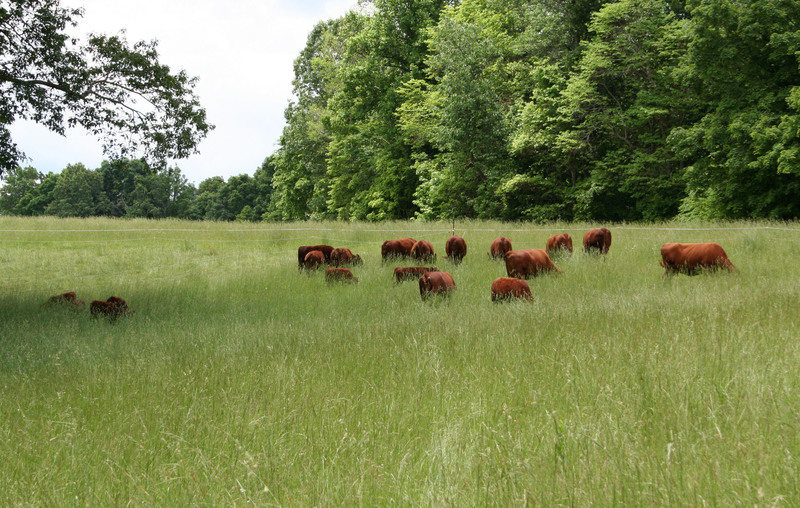 I have enough animals to concentrate their efforts and achieve the benefits of what’s known as high-density mob grazing, where the herd, constrained to a fairly small grazing area, consume a portion, trample a portion, and leave a portion of the forage standing. Currently I’m building paddocks sized to last them a couple of days, moving them before they crop the undergrowth right down to the ground. They aren’t crowded, but they aren’t free to roam and cherry-pick throughout an entire pasture. Since the cows are highly competitive grazers, this method gets them to eat more of what they would rather leave – grass stems and seedheads, for instance. They don’t eat everything and they only get it down to 3-4″ before I roll them into a fresh patch. Concentrating their grazing also concentrates their manure and urine deposits. 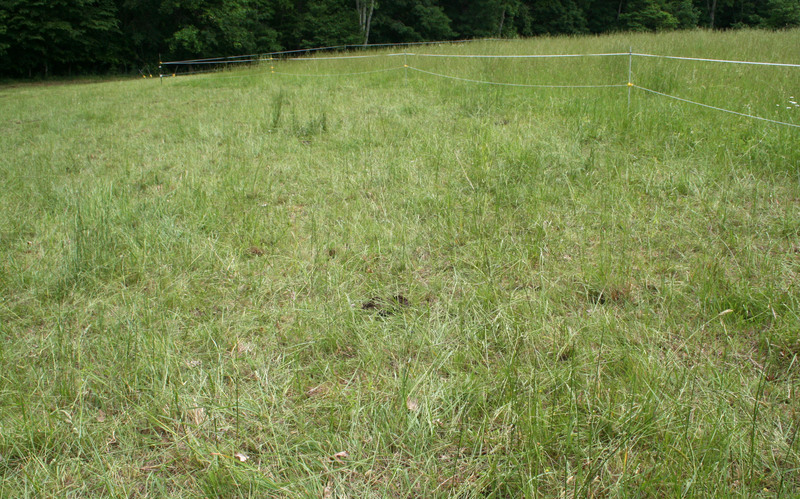 This is absolutely critical to the task of pasture improvement. All my neighbors let their cow herds roam on acres and acres, and they never see much of any benefit from the cows’ fertilization. It’s just too spread out. Without a pack of predators to keep their herd formed up in a group and moving together, the animals disperse and nibble here and there, moving quickly through the pasture and depositing most of their manure under the trees where they rest and ruminate in the shade. This is what the paddock looks like by the time I move them forward. That’s fescue seeding on the other side of the line, and you can see they’ve cropped most of that down where they’ve grazed. Leaving a residual of several inches and a fair amount standing, cleaning up all the weeds and forbs and native clovers, as well as other plants I have yet to identify. Plenty of plant matter trampled into the soil as well. Here is where I take a different approach from many graziers. For many reasons, but mostly to help manage what is already a burgeoning fly population, I drag their manure either the day I move them or the day after. I don’t have Joel Salatin’s egg-mobile chickens following my herd to disperse the cow patties and eat the fly larvae, at least not yet (and won’t for some time). We had significant pink eye infections last fall with outbreaks throughout the very mild winter, and face flies wintered over in great numbers. Face flies are manure-breeders; their larvae hatch in three days, so if I can disrupt that breeding cycle it will help, I hope, keep their population in check, and lower the risk of another cycle of eye infections. Doctoring an entire herd of 1,000 lb beasts of prey with a flight zone of 15 – 20 feet at best, is not fun, for either the animals, or the farmer doing the doctoring. I know all about the drawbacks of spreading cow crap, believe me. Cows avoid patches of grass near manure pats for good reason, and most of the experts say dragging their pies out just makes more grass unpalatable to them next time they graze an area. I’m not so sure it’s as bad as all that, and I’m willing to make that mistake if in turn I’m able to beat the flies down to a low roar by reducing their breeding resource. Chickens would do a better job I’m sure, but I’ve called a moratorium on gaining new livestock until after I get the horses here and settled. And that’s another blog post. Heading up the hill now to continue work on the new horse barn.